The inclement weather on Sunday saw the cancellation of the Northern Velocity O’Cahan’s Trail Race in the Roe Valley Country Park. Thankfully the weather in Newry, while only marginally better, was still good enough for the Dune Half Marathon to go ahead. The final race of the 2017/2018 Sperrin Harriers Winter League Series took place on Saturday 10th February with the 10 mile trail race at Parkanaur Forest. Comprising of three laps of the trail around Parkanaur Forest the course took competitors past the stately Parkanaur House and its gardens and along the Torrent River. Despite the heavy rain of the previous week the course was in good condition and the mild weather on the day provided perfect running conditions for the 113 runners who took on the challenge. In the mens race Gary Slevin (City of Derry Spartans) had an excellent run, winning in 56.34 with Eoin Hughes (Acorns AC) second in 57.21. Christopher McGuire (Glaslough Harriers) completed the top three, finishing in 57.37. Olivia Mullin (Greencastle AC), Cathy McCourt (Unattached) and Karen McLaughlin (Springwell RC) Photo – Richard McLaughlin. Cathy McCourt (Unattached) had another great event, finishing 8th overall in 1.05.20 to win the ladies race. Olivia Mullin (Greencastle AC) and Karen McLaughlin (Springwell RC) had a close contest for second place and it was Olivia who moved ahead on the final lap to claim second place in 1.13.02 with Karen finishing third in 1.13.51. 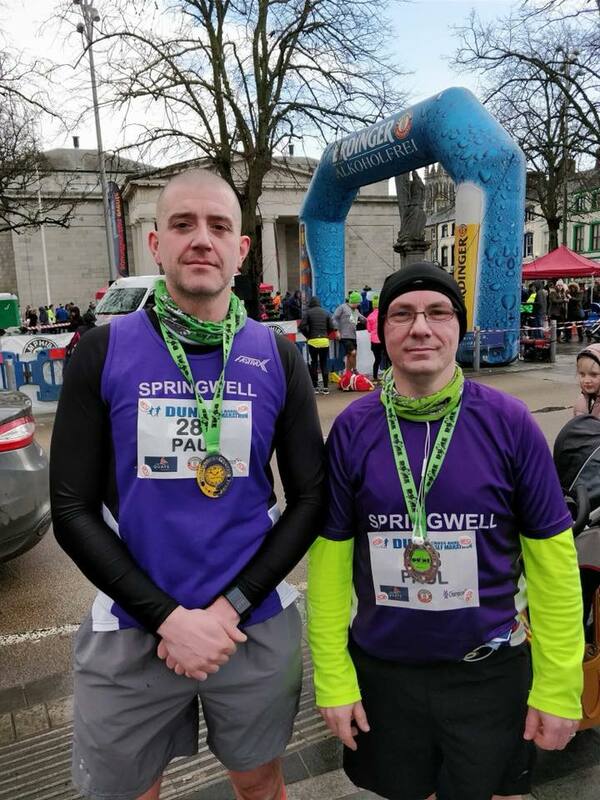 Springwell RC’s Jim Breen had another excellent race finishing 36th overall in a time of 1.17.22 to win the M60 age category. Sunday 11th February saw the first of this year’s Pure Running Half Marathon series with the Dune Half Marathon. In this, it’s tenth year the series will have ten Half Marathons between February and October. 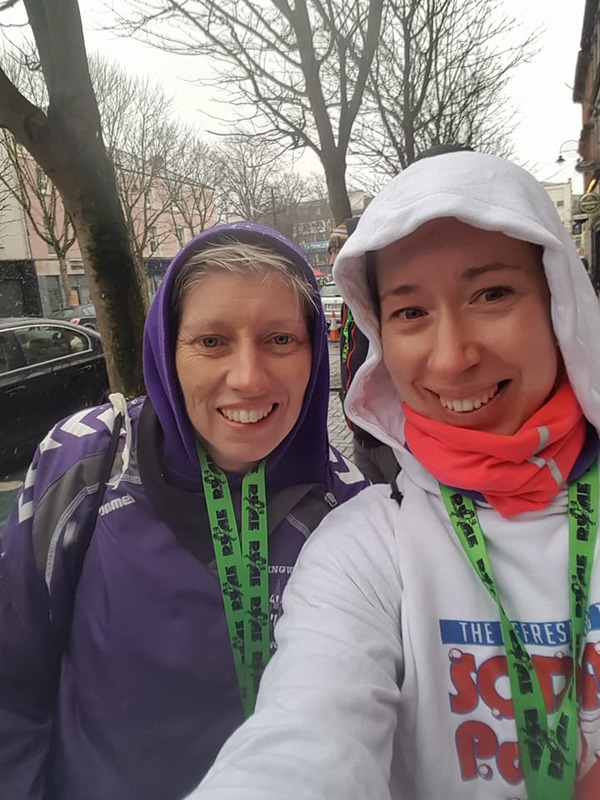 The cold weather and frequent snow showers did nothing to deter almost 750 runners taking to the start line at the Quays Shopping Centre in Newry for the cross border trek to the finish at Market Square in Dundalk. The men’s race was a closely contested affair with less than a minute separating the top three. Brian McCloskey (NE Runners) led the field home, crossing the line in 1.14.56 with Matthew Hewitt (East Coast AC) second in 1.15.33, just ahead of Aaron Woodman (PACE Running Club) who was only seven seconds behind, finishing third in 1.15.40. In the ladies race it was another great performance from Laura Graham (Mourne Runners), who dominated the race to win convincingly in 1.18.18. Laura McDonnell (Tallaght AC) took second in 1.26.58 with Ann Terek (City of Lisburn AC) completing the podium in 1.28.42.